Fortunately I don’t have to hunt for stuff to draw for Every Day in May. I have quite an assignment list going thanks to my card trading on ATCSforall.com and IllustratedAtcs.com. I signed up for a Harry Potter character swap (I’m such a Potter nerd) so I worked on my cards for Day 27. 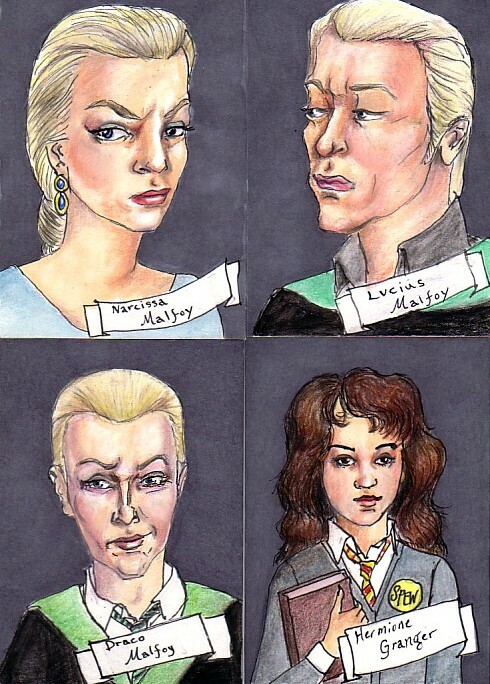 I had a good time coming up with Malfoy family characters. I tried making a Hermione card for a host gift, but she came out looking so passive–not Hermione at all.